I haven’t done a dressgasm in quite a while but I personally found this dress so stunning that I had to show all of you. I typically don’t gravitate toward this style of dress but I find it unique because it almost has a modern haute couture feeling to it. I imagine the lady who owned this dress was very modern for her time and I imagine her to have an artistic temperament. I believe this dress was from the 1880s because of the bustle in the back that you can see in another picture and the double layered skirt with the gathering in the front. 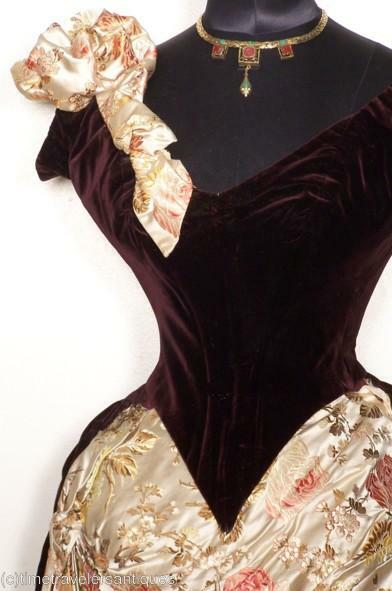 However, the shape of the bodice strikes me as being more modern like the 1890s, so either this lady was rather very fashion forward or the dress was altered later to keep wearing it. I would wear it as long as I could! 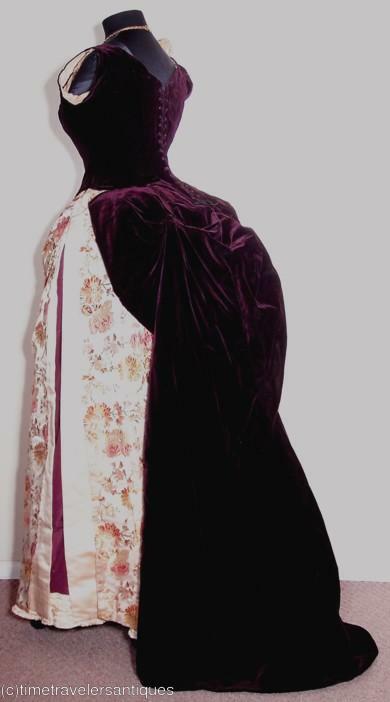 This dress appears to be constructed of deep purple velvet on the bodice and the rear overlay of the skirt, while the floral patterned underskirt appears to be white or off-white brocade. It might be a different type of embroidered silk as well. What makes this dress so interesting to me is the striking color combination with the gathered floral embroidery thrown over the right shoulder. I haven’t seen that as a design element on a dress before in that way. 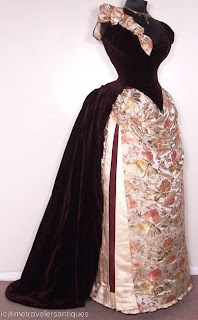 Typically floral accents around the bodice were real flowers that the lady wore for that night. If floral accents were silk, they were typically detachable so a lady could change them to give the dress different looks for different events.